The California State Legislature passed various protections for immigrants in late 2017 making California the first "sanctuary state." Stark internal division within the state and the political parties on immigration is nothing new. The current political climate under the Trump Administration and Jeff Sessions’ Department of Justice, paired with high-stakes midterm elections later this year, have brought new life to the conversation. This series will analyze nuanced dynamics of immigration policy and ideology across California during the 2018 midterm campaign. San Diego region hosts a unique set of voices and opinions in the immigration debate due to its proximity to the border. Shortly after the Department of Justice filed a lawsuit against the state of California over a collection of new laws that protect immigrants in the state - most notably the California Values Act - various cities and entities in California passed ordinances or voted in favor of support of the lawsuit. One of those entities was the San Diego Board of Supervisors, which came as a surprise to some local social service groups and constituents. For those who follow the politics of the Board; however, this was not surprising. The Board voted 3-1 in favor of joining the DOJ lawsuit against California, with the three supervisors representing Northern and Eastern areas of San Diego voting in favor, and the two supervisors representing the Southern and Central areas of San Diego in opposition. Traditionally, Northern and Eastern regions of the county are more white and more conservative, regularly sending Republicans to the state legislature and to Congress. The demographic differences between regions of San Diego tells this story well: North Coastal San Diego is home to a majority of white, upper middle class households, with the most recent American Community Survey data showing a population that is 82 percent white with over 50 percent of households making more than $75,000 annually. The population in Southern parts of San Diego, on the other hand, trends 65-70 percent white with most households making less than $75,000 annually. Consequently, the campaigns of Sam Abed and Kristin Gaspar in North San Diego regions, and Bill Wells in East San Diego reflect this sentiment. These candidates have openly cited the need for more immigration enforcement and sported campaign signs with explicit hardline immigration stances. Supervisor Kristin Gaspar, who won her election to the Board in 2016 by less than 2,000 votes to the Democratic incumbent, is taking this bold stance despite the electoral risk involved. Local political consultants agree that in stark contrast to the progressive wave that President Trump ignited, he has also inspired previously quiet voices within California to take bolder stances on issues like immigration from the standpoint of public safety; even arguing that immigration could be the wedge that Republicans can use to match progressive enthusiasm on the left and hold on to key seats in the region. An exciting Congressional race in Northern San Diego will further test the theory that this is a risk worth taking for local Republicans. 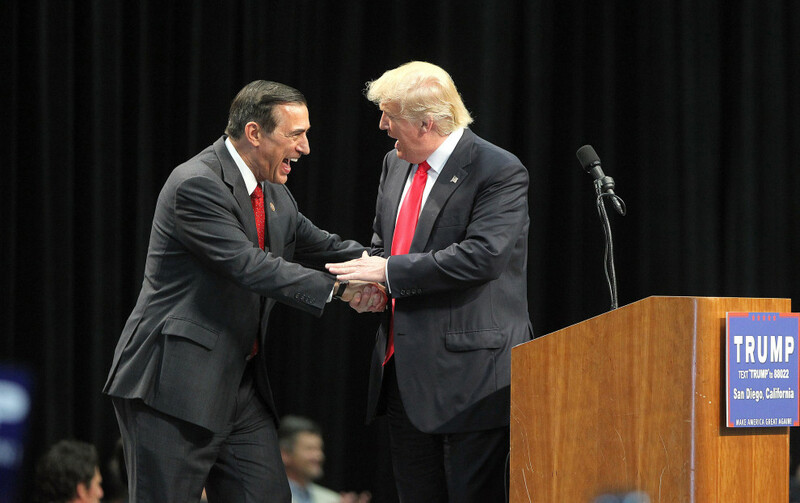 Incumbent Republican Darrell Issa barely held onto his seat in 2016. Democrats from all corners of the ideological spectrum ran in the primary. The results are a cause concern for Democrats going into November. A Republican bested all candidates in the 49th and proved that issues of immigration and overall inclusion can fire up their base. In Southern San Diego, the economic and physical boundaries between Mexico and California can be much more transparent, and integrated transborder communities have been living and working cohesively for decades. Early into Trump’s term, the San Diego City Council decided to side with immigrants and passed a resolution condemning efforts to build the wall, and sided with opponents of the travel ban for refugees. This show of support and solidarity is something that even the Republican Mayor of the City of San Diego has recognized as an important concession. The City and the San Diego Regional Chamber of Commerce recently accepted a grant that funds research to create a regional strategic plan to be a more welcoming and supportive landing place for immigrants and refugees, calling the initiative Welcoming San Diego and working with local immigrant and refugee groups to develop a culturally appropriate plan. San Diego County is home to a vast and dynamic political landscape, and issues surrounding immigration are some of the most divisive. While some residents are excited to host Trump’s border wall prototypes, others are enraged to learn they have paid more than $2 million as of early this year for law enforcement protection of the prototypes. Many residents realize the economic benefits of immigration to the region, while others decry a perceived loss of jobs and opportunities at the hands of immigrants and refugees. As far as the parties go, Democrats have chosen to side with immigrants, while Republicans and conservatives - too afraid to alienate a growing constituency - have remained mostly silent on immigration issues altogether. Now that they have a voice in the highest office in the land, the GOP seems ready to seize on the enthusiasm Trump brings to the immigration debate and attempt to hang on to some key local and national seats of power come November.